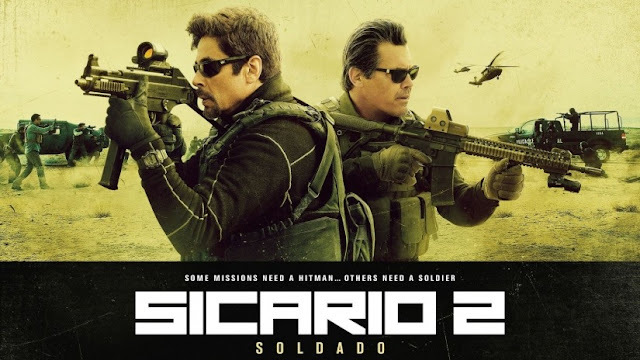 As the Mexican Cartel's start to smuggle terrorists across the U.S border, CIA officer Matt Traver (Josh Brolin) recruits the help of Alejandro Gillick (Benicio Del Toro) in order to take them down. Using one of the top kingpin's daughters to raise the tensions, the plan goes wrong leaving everyone to question what they are fighting for. 'Sicario' spawned the career of screenwriter Taylor Sheridan, making him one of Hollywood's most promising talents and rightfully so after another two successful outings which gained him an Academy Award nomination. Sheridan works closely with crime thrillers, with tensions and stakes being raised continuously culminating in a thrilling finale. For the first time in Sheridan's career, this was not the case as studio interference looks to have caused a blemish on what was so far a perfect résumé. 'Soldado' wastes no time in grabbing the audience's attention, with a graphic but in the long run meaningless terrorist attack within the first few moments. This moment looks to set the tone and main story of the film but soon becomes very apparent that its only intention was merely to shock and showcase a tougher, grittier tone. It's a bizarre start to the film as this incident is barely brought up again and has little effect on the rest of the story. There's no retribution or punishment relating to this attack which is put to the side and forgotten about very quickly. Much like its predecessor, the film focuses on the ways that government bodies will take care of business, even using inhumane and illegal tactics in order to achieve their goals. The grittier tone is carried out with drone strikes, interrogations, kidnappings and murders in broad daylight as the way the U.S may deal with things is shown in shocking ways. There are plenty of exciting and clever set pieces as the main bulk of the film features an interesting insight into just how far these high ranked officials will go. 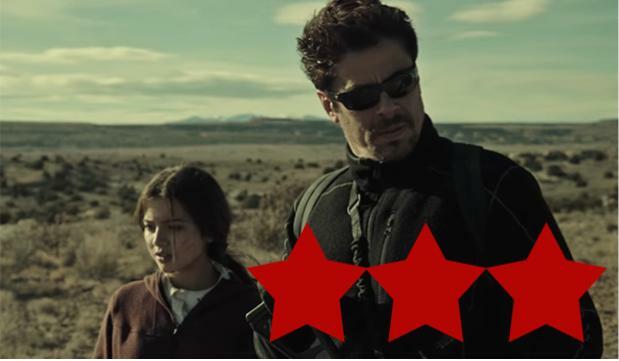 Focusing on a staged rescue mission, the relationship between Alejandro - played magnificently yet again by Benicio Del Toro - and Isabela (Isabela Moner) shows a surprising development of both characters as they bond over trying to survive in tough circumstances. Sheridan showcases his talents as a writer tremendously throughout the main bulk of the film, with great set pieces and dialogue carried out by simple small talk. There isn't as much artistic appeal but Sheridan's strengths shine through creating a thoroughly thrilling and exciting experience nonetheless. However, despite all the good work done creating the main chunk of the film, its decision making in its finale almost completely derails the film. You can basically tell at a certain point where studio interference came into play, as the need to set up further films undoes a lot of the good work previously done. One of the films risks is undone which leads to a cheap and downright cheesy Hollywood ending that ends up being the films most shocking moment. 'Soldado' is a perfect example of why talented filmmakers should be trusted and how studio interference can have a huge negative effect on a film's outcome. Despite the loss of Villeneuve, Deakins, and Blunt, 'Soldado' manages to create an interesting and gritty story nonetheless. Until it's finale, it looked like a very worthy sequel to a great film but is unfortunately tainted due to its extremely poor ending. What was a solid and exciting thriller quickly becomes a disappointment that has you leaving with a bad taste in your mouth.